The fans from the blue collar town of Buffalo, New York have been deprived of seeing David Coverdale & Whitesnake play live for over twenty years. In some cases the only way to see some bands is to take a road trip. So when their tour itinerary was released with Greensburg, PA being the closest headlining show it was a no brainer to check it out seeing how I missed them on their last tour in 2011. Joining vocalist David Coverdale was the usual twin guitar duo of Doug Aldrich and Reb Beach, both whom have been a fixture in the band since 2002. The 2013 version also includes bassist Michael Devin and keyboardist Brian Ruedy. Last but certainly not least the return of the incomparable Tommy Aldridge on drums. Aldridge last played with the band in 2007. The set started off with “Give Me All Your Love”, a song Coverdale always had wanted to open with and has all tour. A rare U.S. play of “Ready An’ Willing” a song so scarce that it has been only played a handful of times in the past thirty years. The band has a long history dating back to its formation out of the ashes of Coverdale’s former band Deep Purple. It was when he was introducing “Gambler”, that Coverdale took the time to note the passing of former members guitarist Mel Galley, drummer Cozy Powell and keyboardist Jon Lord and dedicated the song in their memory. The middle portion of the show highlighted the bands last studio release Forevermore which came out in 2011. Beach and Aldrich were in the spotlight during “Pistols At Dawn” which featured dueling guitars which for my taste was a little too long. I would have rather seen each guitarist get a separate solo. Drummer Aldridge also took a turn in the spotlight during “Steal Your Heart Away”. Obviously this was all in part to give Coverdale a break. The band chose to delve back into the album that helped get them exposed in America, Slide It In. The title cut was run into a medley with an abbreviated taste of “Slow An Easy”. As things wound down, the bands lone chart topper “Here I Go Again”, swiftly followed by “Still Of The Night” a song that many critics feel is the band’s masterpiece brought the evening to a rapid close. Very seldom can a vocalist sound like they did in the past when they have had a long and lengthy career. 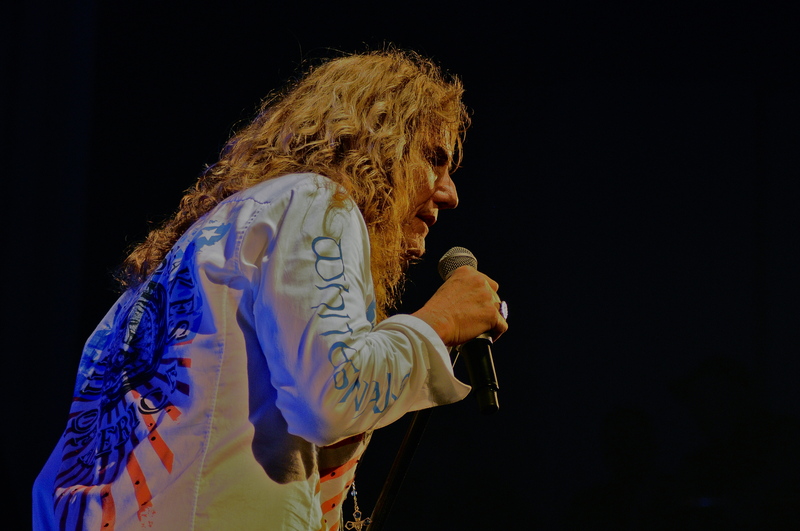 David Coverdale is no exception especially when he has had to overcome several well documented vocal issues in the past. To hear him perform at the improved level he did on this evening as opposed to a few years back is something we should all be thankful for. To be able to see Coverdale and his band of talented musicians still carry on the tradition of playing the Whitesnake classics, well that is simply priceless in 2013.